In 1992, Ford's newly-formed Special Vehicle Team (SVT) announced its birth to the world with the launch of a Mustang Cobra at the Chicago Auto show. Now, twenty years later, it has announced an anniversary model that smacks the original vehicle in the plums. 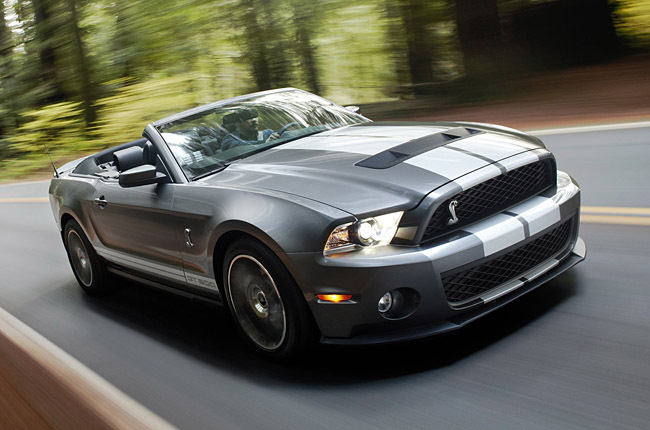 Meet the 650bhp Shelby Mustang GT500 convertible. That's right, 650bhp. The original Cobra SVT had a 5.0-litre V8 with 235bhp, and even last year's Shelby GT500 had 550bhp. So the arrival of 100 extra ponies should cure mankind's insatiable appetite for hooning. It gets the coupe's 5.8-litre supercharged V8 - complete with 600 torques - as well as SVT-designed Bilstein electronic adjustable dampers (available with the performance pack) with two modes, Sport and Normal, a Brembo brake setup and tuning that has resulted in this new convertible going 3.5 seconds quicker around Sebring Raceway than its predecessor. Although it might be the new illuminated side sill with ‘SVT' that contributed to the faster time. SVT chief engineer Kerry Baldori pointed out that the convertible is a car that can mix it with both road and track. "All of the significant changes we made in the program were instrumental in delivering a convertible that could really shine on the track but can still be driven on a daily basis." Assuming that ‘daily basis' accommodates a healthy tyre budget. this news has taken from BBC topgear.